These images are representative of types of persons and situations HGRBS appeals to for participating in serving private home heads in the U.S.
HGRBS is a non-profit 501(c)(3) corporation/ministry of independent volunteers. Exclusive emphasis is on supporting your rights and privileges as an American private home head towards making better contract-related decisions and getting better results from the people you hire to assist with your special home maintenance and improvement projects. If you would like to volunteer helping to share useful information with other private home heads for making safer-wiser hiring decisions please confer via VolunteerMatch. Thank you for your availability! HOMEOWNER'S FAST TRACK TO BEST CONTRACTORS! 1. Connect with legitimate U. S. private home residents to share information crucial to making more discreet home maintenance and improvement decisions. 2. Support our citizens by every legal means permissible through being proactive and responsive to their related inquiries and reasonable requests customized to their situations. To this effect, we will always provide major online/offline information services free of charge to our constituency of American private home decision makers, and to those with related aspirations. Stated clearly, as a non-profit 501 (c) (3) network of independent volunteers from all over the United States, our most fundamental service ethic in this regard entails volunteering in and from our own communities towards the greater good of US residents. 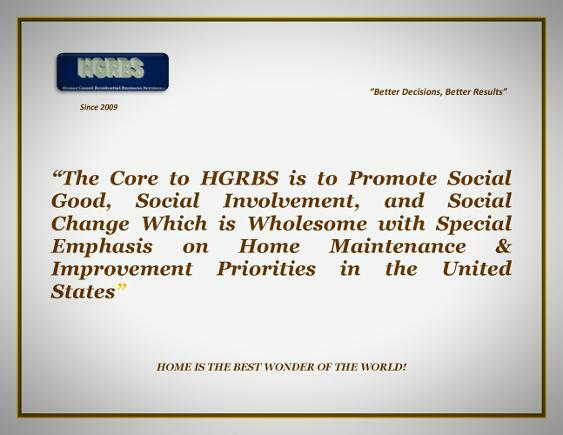 In other words, HGRBS is an open association for concerned people across America working together volunteering towards informing, inspiring, and guiding legitimate private home decision makers and those with related aspirations towards making safer and better home maintenance and improvement decisions. To these ends, each of us draws from his/her own resources exercising individual support prerogative to invest in facilitating the mission of this network in our own vicinities, foremost. We realize that, on the overall, from the newest volunteer community advocates to the oldest and highest ranking elected officials, that our residents lose hundreds, thousands, hundreds of thousands, and millions of dollars per household on bad home maintenance and improvement decisions. We also understand that each of us, as American citizens, has a role to play in supporting the intents and efforts of our government towards the comforts and conveniences of the private home setting. Therefore, we acknowledge, respect, and honor our government's concern and related activity, from state to state and collectively, being one nation under God. Finally, we have concluded that in order to help our government do more for our people against making costly, ill-timed home maintenance and improvement decisions in our country(at times being blindly defrauded by dishonest people), we must do more as citizens to voice our concerns...not only by our words....but by our actions. To this end, we speak and act. *These are free online informational home services, exclusive to legitimate U.S. private home decision makers residing in truly detached structurally independent homes which are single-family, duplex, and small to mid-sized mansions and estates. VOLUNTEERS ARE NOT "MEMBERS" OF HGRBS ONLY "PARTICIPANTS"
Individuals who volunteer "with" HGRBS are not "members." Instead, we are private individuals who support promotion of residents making safer and wiser choices about those we hire to meet our home maintenance and improvement needs. 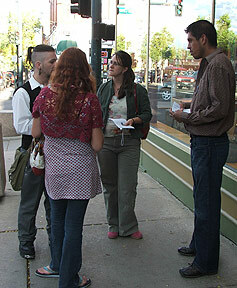 What we do is on our own time and schedule. HGRBS is only a guide offering suggested activities we can do to help reduce the incidence of victimization of our private home heads by corrupt individuals operating as "contractors."